St Augustine accepted this symbolic explanation of these animals, but proposes what he calls “a more reasonable application of the figures” than that made by St Irenaeus and others, without critiquing anyone by name. In his book On the Harmony of the Gospels (1.6.9), he refers the lion, the king of the beasts, to Matthew, who speaks about Christ’s royal descent from King David, and tells us that the Magi called Him “the King of the Jews.” The man is referred to Mark, “who handles the things which the man Christ did”, and the ox to Luke for the same reason as Irenaeus. Since the first three animals “have their course upon this earth, (i.e., they walk and do not fly) … in like manner, those three evangelists occupy themselves chiefly with the things which Christ did in the flesh … Whereas John … soars like an eagle above the clouds of human infirmity, and gazes upon the light of the unchangeable truth (i.e. the divinity of Christ) with those keenest and steadiest eyes of the heart.” This last part refers to a common belief in the ancient world that eagles could look directly at the sun. Folio 27v of the Books of Kells, ca. 800, showing the Symbols of the Four Evangelists. 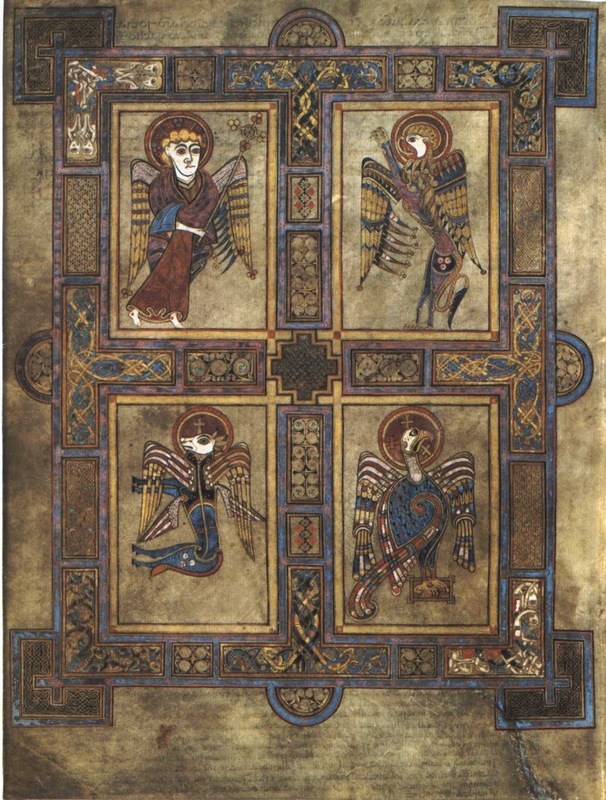 The book of Ezekiel also proves that these four Gospels were foretold long before, in which the first vision is formed thus: “And in the midst thereof the likeness of four living creatures: and the countenance thereof, the face of a man, and the face of a lion, and the face of an ox, and the face of an eagle.” The first face of the man signifies Matthew, who began to write as of a man, “The book of the generation of Jesus Christ, the son of David, the son of Abraham.” The second is Mark, in which the voice of a lion roaring in the desert is heard, “A voice of one crying in the desert: Prepare ye the way of the Lord, make straight his paths.” The third is that of the ox, who prefigures the Evangelist Luke, who took his beginning from the priest Zachariah. The fourth is the Evangelist John, who taking the wings of an eagle, and hastening to higher matters, treats of the Word of God. 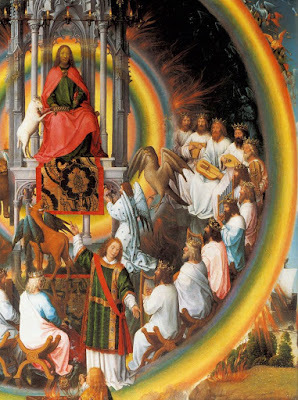 Detail of the St John Altarpiece by Hans Memling, 1474-79, showing the vision of St John in Apocalypse 4. Part of Ezekiel’s vision, 1, 10-14, is read as the Epistle at the Masses of Ss Matthew and Mark, but not those of Ss Luke or John. (It has been removed from the lectionary of the post-Conciliar rite.) In the Tridentine Breviary, Ezekiel, 1, 1-12 is read at Matins of Ss Matthew, Mark and Luke, and the whole of Apocalypse 4 is read on the Octave of St John. This is the limit of the liturgical use of these passages on the feasts of the Evangelists. In its habitual conservatism, the Roman Breviary has proper readings for the Evangelists at Matins, but uses the common office of Apostles for everything else; St John has a mostly proper Office, but the other three do not. None of the proper musical texts (antiphons, hymns, responsories) of St John’s office or the common of Apostles cites either of these passages. There does exist, however, a more complete proper office of the Evangelists, which is found in the Breviaries of the Dominican, Carmelite and Premonstratensian Orders, and most medieval Uses. It has nine responsories, all of which quote the visions of Ezekiel, although these were not received by the Dominicans. It also includes these three major antiphons, for the Magnificat of both Vespers and for the Benedictus at Lauds, which refer explicitly to the tradition of the four animals as symbols of the Evangelists. Ad Magn. Aña Ecce ego Joannes vidi ostium apertum in caelo; et ecce sedes posita erat in eo, et in medio sedis et in circuitu ejus quattuor animalia plena oculis ante et retro: et dabant gloriam et honorem et benedictionem sedenti super thronum, viventi in saecula saeculorum. At the Magnificat of First Vespers Behold, I, John, saw a door was opened in heaven, and behold there was a throne set in heaven, and in the midst of the throne, and round about it were four living creatures, full of eyes before and behind; and they gave glory, and honor, and blessing to him that sitteth on the throne, who liveth for ever and ever. Ad Bened. 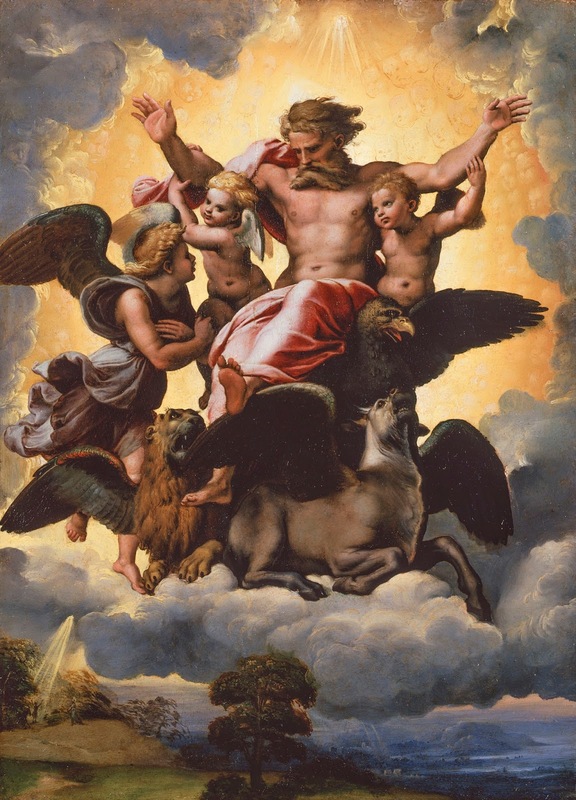 Aña In medio et in circuitu sedis Dei quattuor animalia senas alas habentia, oculis undique plena, non cessant nocte ac die dicere: Sanctus, Sanctus, Sanctus Dominus Deus omnipotens, qui erat et qui est, et qui venturus est. At the Benedictus In the midst and round about the throne of God, four living creatures, having wings, full of eyes on all sides, rest not day and night, saying: Holy, holy, holy, Lord God Almighty, who was, and who is, and who is to come. Ad Magn. Aña Tua sunt haec, Christe, opera, qui sanctos tuos ita glorificas, ut etiam dignitatis gratiam in eis futuram praeire miraculis facias: tu insignes Evangelii praedicatores animalium caelestium admirabili figura praesignasti: his namque caeleste munus collatum gloriosis indiciis es dignatus ostendere: hinc laus, hinc gloria tibi resonet in saecula. At the Magnificat of Second Vespers These are Thy works, o Christ, who so glorify Thy Saints, that Thou also cause the grace of dignity that will be in them to be first preceded by miracles. Thou marked beforehand the wondrous preachers of the Gospel by the marvelous figure of the heavenly animals; for by these glorious signs, Thou deigned to show the heavenly gift given to them; hence let praise, hence glory resound to Thee forever.